The Biggest Log Cabin in Dorset?! 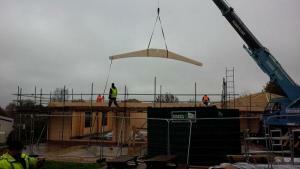 NEW FOREST LOG CABINS is undertaking one of the largest log cabin builds in Dorset at Merley House Holiday Park. This complex will include an indoor swimming pool, sauna area and offices/reception area. The build was started in the late autumn of 2013 and is scheduled to be completed by the end of February 2014, with plans for a special event for the Grand Opening. The logs themselves come pre-treated and waterproof. The building once erected, can be painted in a colour of the client's choice, in the case of Merley House they have chosen to keep a natural wood colour. All the logs work on an interlocking system, so the structure is extremely strong and consequently is very easy and timely to erect. The Company is registered with the FSC (Forest Stewardship Council), which is part of the Rainforest Alliance. This Alliance ensures strict guidelines are adhered to with regards to forest management, thus ensuring forest sustainability, which is extremely important to New Forest Log Cabins. 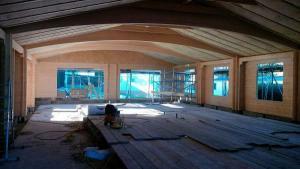 To date the Merley Pool House Project is on track for its completion deadline, the external shell of the building is nearly completed, and the plush internal fitting is underway. 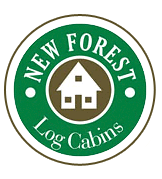 NEW FOREST LOG CABINS has been established since 2002 and is renowned for its bespoke and high quality builds. The company can offer a large variety of buildings which can all be designed to the client’s specification. The company has assembled Chalets, School Nurseries, Pool Houses, Log Cafes and Granny Annexes, as well as Mobile Log Homes and other forms of log building. 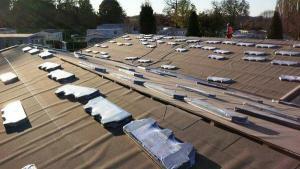 We are based in Wimborne, Dorset and are able to offer free, no obligation site visits within a 15 mile radius. We offer a complete service ensuring your project goes smoothly from start to finish. Our service includes drawings for planning, help with your planning requirements and if required, we will fit out the interior of the structure to your individual specifications.